Co-founders of the Richmond Art Collective, Anne-Claire Mitchell (left) and Rebecca Chadwell. Although there's always room for more and different kinds of art, the Inland Northwest is already rich with opportunities to experience art, especially during ArtWalk Fridays when venues can swell to include restaurants, coffee shops, even tattoo parlors. The region's colleges and universities elevate discussions of art in society by sharing work of students, faculty, visiting artists and, in the case of venerable institutions like Gonzaga University's JUNDT ART MUSEUM, pieces of their permanent collection. Boutique galleries typically blend various types of art — paintings, but also wearable art like textiles or jewelry — in a welcoming setting, like Coeur d'Alene's STUDIO 107, a gallery/wine bar which exhibiting artist Clancie Pleasants describes as "unpretentious and comfortable." Some galleries are attached to frame shops, while others feature artists at work, like the DAHMEN BARN in Uniontown, Washington, south of Pullman. Galleries can also be organized around a theme or medium, like the extraordinary glass found at ESSENTIAL ART GALLERY & FINE ARTS in Moscow, Idaho. With so much from which to choose, local experts are a good resource, offering suggestions on the region's essential galleries: places that put art exhibition at the forefront of their mission and consistently deliver a particular kind of experience. Karen Mobley is an artist, poet and former program manager at Spokane Arts Fund with an extensive background in public arts administration. On First Fridays in Spokane, says Mobley, she usually goes to TRACKSIDE, KOLVA-SULLIVAN and BARRISTER WINERY. "Kolva-Sullivan has a range of exhibitions, but I am happy to see artists show there that I don't know, especially group exhibitions like the ones from the Archie Bray Foundation [for the Ceramic Arts] in Helena," says Mobley. In addition to annually showcasing the best in ceramic arts, Kolva-Sullivan features both emerging and established contemporary artists in a wide range of media, organized around a theme or presenting a comprehensive body of work from a single artist. Exhibits at the CHASE GALLERY in Spokane's City Hall, says Mobley, are typically "curated with a theme or structure that gives them an orientation toward an idea." Chase features family-friendly group and solo shows, including an annual exhibit of regional art-college graduates. Conrad Bagley is an art circle fixture, with 30 years as an artist and therapist. His Spokane favorites includes NEW MOON GALLERY in Spokane Valley, which he attends partially to learn about upcoming gallery classes. "Being a co-op, there are a variety of personality types that create a wide range of art," says Bagley. "There is always something new on the wall and projects in the works." The gallery features mostly female artists and is an exemplar of textile, ceramics and handcrafted works, including of gallery founder Michele Mokrey, who makes art-to-wear textile and fiber accessories. In Sandpoint, PEND OREILLE ARTS COUNCIL shares good energy and art with the entire town through their annual ArtWalk, which celebrated its 40th anniversary in June. "POAC offers a continuing venue for local visual artists with shows and receptions at the POAC gallery and the local Columbia Bank, as well as seven other locations in the north Idaho area throughout the year," says POAC President Carol Deaner. 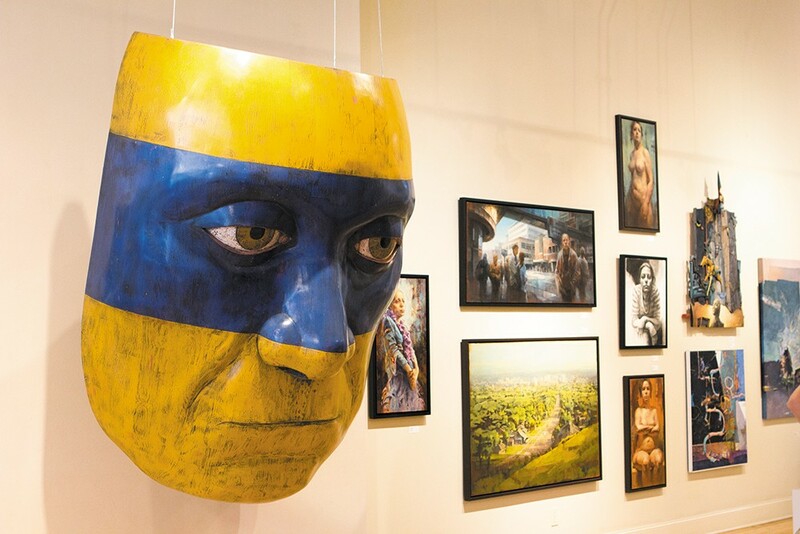 Michael de Forest's "The Mask" at Art Spirit Gallery. Not all artwork fits in a box, on the walls, or on a pedestal. Both RICHMOND ART COLLECTIVE and SARANAC ART PROJECTS feature painting, drawing, printmaking, sculpture and mixed media alongside video, performance and installation art. "Not only has Saranac Art Projects provided a place for patrons of all ages to interact with challenging and engaging art, but it has been a place for artists in Spokane and the surrounding area to push the envelope in their work," says Lance Sinnema, a senior lecturer at Whitworth University who helped found the cooperative gallery in 2007. Progressive, innovative artwork appeals to her, says Tarin Leach, a Coeur d'Alene-based artist and former program director at St. Vincent de Paul's Art on the Edge. Her top three Coeur d'Alene galleries include EMERGE, BLACKWELL GALLERY and THE ART SPIRIT GALLERY, which Leach views as different levels of innovation. "I like Emerge," says Leach, "because the atmosphere is always a little bit more hip, more modern, more of the alternative art." Nearly all of our respondents put Coeur d'Alene's THE ART SPIRIT GALLERY at the top of their list for essential galleries in the region. "I've traveled to many places, visiting galleries all over, and without a doubt the staff and art exhibitions at Art Spirit Gallery are world-class," says Katherine Nelson, one several dozen artists celebrating in the gallery's 20th anniversary exhibition in 2017. The gallery, she says. "brings the best talent, with the right mix of verve and regionalism, to create an exciting mix of artistic style and statement."